Special thanks to Kyo-Green for sponsoring this healthy, low carb breakfast recipe. The green smoothie has become quite the popular breakfast staple over the last few years. I'm all for healthy greens playing a starring role in people's lives. The problem is all of the other ingredients that people layer in that end up skyrocketing the sugar levels of what used to be a healthy breakfast. That's why I'm bringing you a fruitless green smoothie bowl recipe today. Too much sugar, even the healthy kind in fruit, can cause imbalances in the body. The fructose sends insulin levels high, and guess which direction they go after that? Yup, crashing down. All that sugar can be tough on your digestion as well. Without proper digestion, you're not going to absorb all of those great nutrients that you're trying to ingest. So I have an extra helper for your digestion in my fruitless green smoothie bowl - Kyo-Green Sprouts Blend Powdered Drink Mix. 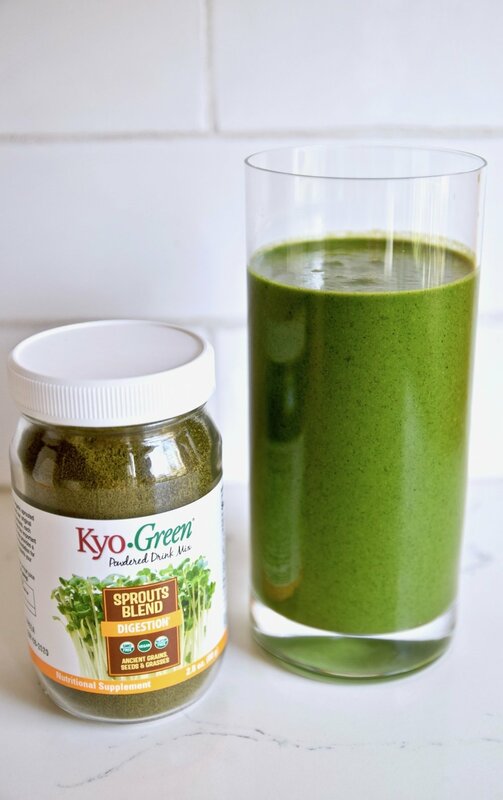 Kyo-Green went ahead and created a special organic sprouts blend for your digestion with goodies like quinoa, lentils, flax, broccoli, sunflower, and pumpkin. They didn't stop there. They also included a great greens blend with barley grass, wheat grass, brown rice, FOS from chicory root, and chlorella. Even if you don't know how to pronounce some of those words, you should just know that these ingredients all provide good prebiotics to help your digestion work its magic with ease. Happy digestion equals happy body. I added some avocado to the green smoothie bowl for healthy fat and protein. Coconut milk ups the fat ante, and lemon and apple cider vinegar will also help with proper digestion, so you're covered from all angles. I decided on this fruitless green smoothie bowl instead of a straight up drink because I know that some people like to chew. Chewing can also lead to a better feeling of satiety. Often times when you drink a smoothie, you still feel hungry at the end. When you're eating out of a bowl and chewing some crunchy toppers, your mind and body both get with the program that you're having a proper meal instead of just a drink. Oh, and the crunchy toppers are also half the fun. You get more healthy fat and protein with my choices of coconut, hemp, and sesame seeds. Feel free to mix and match your favorite nuts and seeds. And because you've kept your smoothie bowl fruit free, you could go a little crazy and throw a berry or two on top. That'll still be a lot less sugar than if you blended bananas and dates in the smoothie. You'll also get some natural sweetness to balance out some of the greens. Place all of the ingredients except the toppings in a high-speed blender and process until smooth. Spoon into two different bowls and add desired toppings. Enjoy! Thanks to Kyo-Green for sponsoring this post. All opinions are always my own. Looking for Other Smoothie Recipes?